During one week of semester, you have a special opportunity to try how it is to be a University student and meet up with a lot of people that you will be probably encountering the very next period of your life. It is not only about choice of the right University for you. Thanks to a rich program, MiniErasmus opens up an entirely new world for you in which we will tell you everything about options you did not even know about. Our goal is to show you that working on your future now is worth it. The information you obtain on our project will be a well-recieved advantage that will definitely help you achieve your goal in the future. WHAT CAN MINIERASMUS OFFER YOU? Experience real lectures and classes of University! Is this study field the right one for me? MiniErasmus gives you the opportunity to experience real-time lectures and classes of Universities. No longer will you recieve second-hand information. Get to know the system, environment, get in touch with professors and University students. We offer you four days during which you can learn everything about your desired University or Faculty! Get a new friend – tutor! So you won´t get lost in new environment, we will give you a person called tutor – student of particular University prior the project. Your tutor is here to answer all your questions and during the project he will show you the school or the city if you want. Find out how you can really get a job with a diploma from you desired University! Your education is really finished when you find a way how to „sell“ your skills on the market. MiniErasmus tells you, what you can really do in your desired professional area. During the program, we facilitate information sessions with professionals from various fields who will give you a realistic overview of particular work area. Are you the right person for the job? You can only find out at MiniErasmus! Workshops and sessions you will never experience at home! We will provide you with opportunities which you could never get during your ordinary school day. Do you want to know how to travel cheaply? How to impress others? How to memorize the huge amount of homework you got the other day? Are you interested how to write blog properly? We offer you workshops on pragmatic topics from true specialists. We are also preparing for you sessions and discussions with various publicly known persons and top-level speakers on different current topics. Become part of a community which will show you what opportunities you have! MiniErasmus is an opportunity to get in touch with huge amount of people. Tutors, partner organizations, people from companies and other participants – thanks to our evening networking events you get to know people that will show you much bigger world than the one you are used to from home. 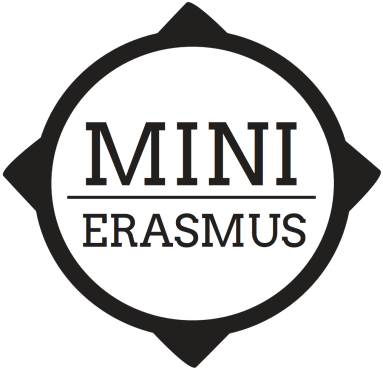 MiniErasmus is currently available only for Slovak and Czech high school students. If you are willing to help us expand the project abroad, please let us know at info@futuregenerationeurope.eu.